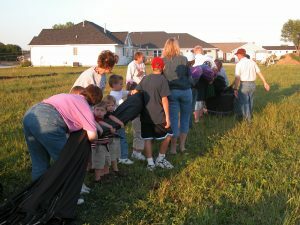 A hot air balloon ride lasts approximately one hour. Flights are in the morning about sunrise and late afternoon about two hours before sunset, weather permitting. 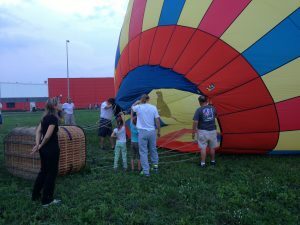 Your ballooning experience usually takes about two hours, including launch, flight, recovery and returning to the launch field. 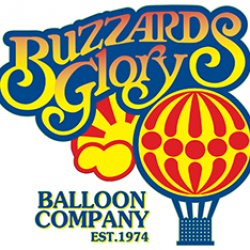 We wait to inflate the balloon until you arrive. It only takes about ten to fifteen minutes and you are gently lifting off beginning a magical experience. Your flight path will be determined by the direction of the wind. 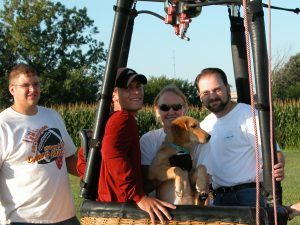 You could find yourself floating over a tree line, over the city of Cedar Rapids or out in the countryside. It’s your own private guided aerial tour of the area. Rides: Usually a ride is for two people plus the pilot however, we can accommodate up to three people depending on size, weight and outside temperature. Rides cost $450, this is for one or two passengers please call us or email us for pricing on three or if you have any other questions. Restrictions: All passengers must be at least 12 years of age. Expectant mothers must wait to celebrate after the baby is born. Rides for senior citizens in good health are possible on calm weather days. Tethering: $750 for one hour, $500 each additional half hour. Tethering, anchoring the balloon to long ropes allowing the balloon to ascend and descend, provides an opportunity to give a succession of rides. Educational Opportunities: Our pilots are available to speak to groups and organizations regarding the art and science of ballooning. We have been presenting to area schools for thirty years. The ride lasts about 1 hour but plan on 3 hours, more time will be needed if we have to do any hog wrangling. Its fun to invite friends and family to watch take off, landings are not in a set location it depends on the mood of the wind and pilots. It’s possible we may have to move launch locations if winds shift direction. While this may seem that we can’t make up our minds, we do it mostly to see how many cars we can get to follow the leader from place to place. The flights last about 1 hour and just like the airlines you will need to pay for extras if you want them, seats, bathrooms, meals, luggage are all extra. Landings while not optional may involve a slight bump, if you have any conditions that would prevent you from jumping off a 3 story building please let the pilot know. You will need to sign a couple of forms before we can take you for a ride, one is an acknowledgement that you’ve been given last rites and the other is power of attorney. These forms will need to be signed, witnessed, notarized and sealed with a kiss prior to liftoff.